Press Release: February 25, 2019 By Dragon Fire Boxing – Brisbane’s Reagan Dessaix is looking to bounce back immediately after losing a controversial decision last Friday evening to former IBO World Champion Blake Caparello. The 10 round contest saw Dessaix act as the aggressor in the contest, and appeared to be firmly in control from round 3 onwards. Despite this, the contest was awarded to Caparello by the judges at ringside, which didn’t sit too well with boxing fans on social media. Dessaix discussed his clash with former Sergey Kovalev foe Blake Caparello. The President’ said, “I felt I controlled the fight as did everyone in attendance and there was an outpour of dismay on social media after the fight, surely everyone can’t be wrong! Discussions amongst boxing fans of an immediate rematch were natural, as those who witnessed want to see who would emerge victorious in a rematch. Dessaix, a big supporter of Everton FC, opened up about his plans going forward. The 22-year-old said, “If the rematch was offered to me I would be interested definitely, however, it would have to be on our terms. I was the true winner so the rematch would have to be on our terms. Material Courtesy of: Dragon Fire Boxing/Photo Courtesy of: H.M. Murdock Used with permission. Press Release: By DAZN/Matchroom Boxing USA –LONDON, Feb. 25, 2019 – In a press conference on Monday afternoon, DAZN and Matchroom USA gathered across the pond in London to formally announce the United States debut of Anthony Joshua who will defend his WBA Super, IBF, WBO and IBO World Heavyweight titles against Brooklyn’s Jarrell ‘Big Baby’ Miller at Madison Square Garden on Saturday June 1, live on DAZN. “UK, what’s up? I’m in a better mood as you can see, I had a cup of tea. I’m just chilling, I already said what I had to say. You already know how I feel about AJ, you all know my back story, know where I come from, and know where we’re going. It’s a blessing to be here, and I just can’t wait for June 1." “You know I come from a great family, my mother raised me well, my father raised me well, my aunts and uncles, my brothers and sisters, we all look after each other. My cousin was fighting at the time, I got banned from where I grew up, got in too much trouble, and moved out of the area. I sat down in boxing because I used to drive my cousin and I was making money, had the car back then, and I used to sit back and think that looks easy. He lent me 35 pounds, about 25 dollars, I went to buy boxing boots and he gave me some shorts. I started training, I got beaten up a bit, I beat a few people up, and from the point forward I realized do I want to smoke and drink? Face the verge of jail or do I want to focus on boxing? If you look at the state of my hands, this isn’t from boxing, this is from street fighting, so I realized I was getting in trouble for fighting in the streets and getting patted on the back for boxing, so I started boxing. Boxing to me isn’t about Jarrell Miller, it’s not about Tyson Fury, Dillian Whyte, it’s about me - what does it make me, as a person. I changed my life style around, my family’s life style around and we’re impacting the community. All my friends over here, we have some great plans for the community, and that’s what impact means to me. 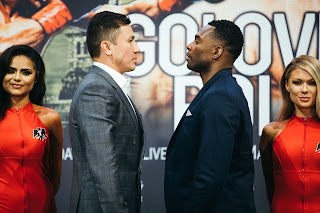 Material Courtesy of: DAZN/ Photo Courtesy of: Mark Robinson/Matchroom Boxing USA Used with permission. In previewing the Welterweight battle between longtime contender Brandon Rios and former two-division world champion Humberto Soto, this observer called it the very definition of a “Crossroads Fight.” Two fighters at the stage in their respective careers where both are attempting to rebuild and get back into contention for an opportunity at a world championship. Readers may have noticed in that preview prior to the fight that yours truly did not spend much time analyzing what each fighter brought into the fight. This was because I felt overall that the story of the encounter was one that was straightforward in terms of the style of the two fighters. A fighter in Rios, who is known as someone who will come forward and attempt to both apply constant pressure and a high offensive output against a boxer/puncher in Soto, who could go toe to toe with his opposition if needed, but was more known for being a tactician in his approach. When it comes to a straightforward stylistic fight such as this, it will often come down to who is able to dictate the tempo of the combat as I said in previewing this encounter. It did not take long when the two fighters met on February 23rd at the Municipal Auditorium in Tijuana, MX to find out who that fighter would be. Humberto Soto would make the story of this fight one that would be simple to describe. For twelve rounds, Soto put on what could best be described as a Boxing lesson. Soto generally was able to get his punches off first and dictate how the fight was fought. What particularly impressed me about Soto’s performance was that he gave Rios angles and timed his offense consistently throughout the fight. This included throwing his punches in short spurts and often in combination. Despite being under consistent pressure by Rios throughput the fight, it was Soto’s timing that would offset that pressure and even at times catch Rios as he was coming forward while Soto was against the ropes. What was also not touched upon by yours truly in previewing this fight was that this was also an encounter one might argue between two advanced-age fighters. Although some might not think of the age of thirty-two, the age of Brandon Rios, and the age of thirty-eight, the age of Humberto Soto as advanced it is important to remember that both fighters have been through their share of wars throughout their careers. Even in an era where several marquee fighters have been able to compete at the top level of the sport well into their forties, it is still an impressive feat to see a fighter do what Humberto Soto was able to do in this fight as the offense in spurts, effective angles, as well as being able to make the punches Rios threw less effective resulted in a convincing twelve round unanimous decision. Despite having periodic moments throughout the fight, Rios could not find a way to turn the ebb and flow of the combat in his favor. One aspect of offense that I feel would have served Rios well would have been to attempt to attack Soto’s body more consistently throughout the fight. This theoretically would have had an effect on Soto’s movement as the fight progressed and perhaps would have made him more vulnerable to Rios’s pressure. By being unable to get his punches off first and unable to stop Soto’s offensive spurts, it did not lead to success in this fight for Brandon Rios. While some might say that the fighter who did not emerge from this encounter with a victory might be heading for retirement I’m not sure. Despite the result of the fight being clear and convincing in favor of Soto, it was still a competitive bout that was entertaining to watch. Even though he came out of this fight on the losing end, Brandon Rios remains a fighter with an entertaining style, who no matter who he fights will provide excitement for Boxing fans. Although this fight was between two fighters on the comeback trail, it is also important to remember that one loss does not always indicate whether a fighter’s comeback was overall a success or failure. This observer does not believe Brandon Rios is done necessarily as a fighter. I do believe however, that he should take some time to recoup from this fight and reevaluate what did not work in this fight and see if he can adapt in subsequent fights to come. As for Humberto Soto, he will likely get another opportunity against a top contender in the talent deep Welterweight division. Whether or not Soto, who has previously held world championships in the 130lb. Jr. Lightweight and 135lb. Lightweight divisions will get an opportunity to become a three-division world champion in the 147lb. Welterweight division remains to be seen. If he can continue to win and more specifically win in impressive fashion as he was able to do in this fight against Brandon Rios, Humberto Soto may be the latest in a growing list of notable boxers to prove that for some fighting and competing at a top level at what is seen as an advanced-age can be done and be done successfully. We would like to let our readers know that new material discussing the recent Welterweight bout between two-division world champion Humberto Soto and longtime top contender Brandon Rios is currently in the works and will be released here on the website on Monday, February 25th. Stay tuned. "And That's The Boxing Truth." Brandon Rios has been a fighter who has endeared himself to Boxing fans with a crowd pleasing style and his willingness to fight anymore. Rios, who at one time held interim/regular champion status in the World Boxing Association (WBA) ratings as a 135lb. Lightweight, has faced several top fighters throughout his career including Manny Pacquiao, Timothy Bradley, and Danny Garcia just to name a few. Although he has not gone beyond the status of a top contender, Rios’ style is one that always ensures fans of an exciting fight. After being stopped in February of last year by Danny Garcia, one may have wondered how much Rios had left in him as a fighter. The longtime contender however, began his rebuilding process in November of last year scoring an impressive ninth round stoppage of veteran Ramon Alvarez. Now Rios looks to continue his comeback as he will face former two-division world champion Humberto Soto on Saturday night at the Municipal Auditorium in Tijuana, MX. The fight, which will main event a card televised by digital streaming network DAZN is the very definition of a “Crossroads fight” between two veterans. In Soto, Rios will face a veteran of eighty professional fights and a fighter who much like Rios has faced some of the best fighters of his era. Soto has held world championships in both the 130lb. Jr. Lightweight and 135lb. Lightweight divisions. While both fighters have previously fought at lower weights, this bout will be fought in the 147lb. Welterweight division, a weight class where both fighters have spent their recent careers competing in. 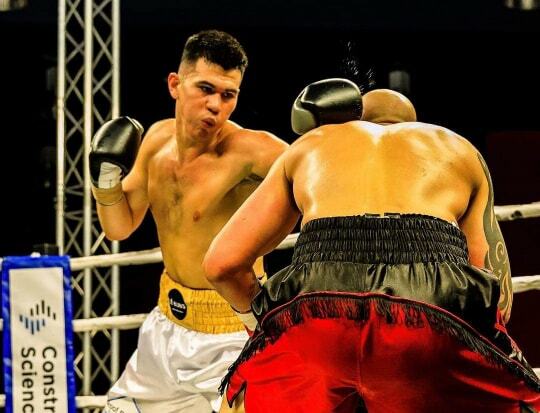 Soto is at a similar stage in his career as Rios having won his last three fights since losing a ten round decision to Antonio Orozco in October 2015. Despite scoring two knockouts in those three wins, those three opponents were not well-known and facing a fighter of Rios' caliber is likely to provide Soto with a stern test. Stylistically, this is an interesting fight between a fighter in Rios who is known for applying consistent pressure on his opponents going against a boxer/puncher in Soto. The key to this fight in my eyes will be which fighter can establish the tempo. This will be an encounter between two fighters who have throughout their careers shown a willingness to go toe to toe with their opposition. Brandon Rios is the type of fighter that looks to apply pressure from the outset and continues to come forward throughout the course of a fight. Although Soto has been more than willing to mix it up in the past, I believe it will be crucial that he attempt to box Rios and not stand and trade. Humberto Soto has also shown he can be very technical in his approach in the past and this observer feels he will need to execute a tactical fight plan in order to be successful in this fight. What may lie ahead for the winner of this fight is something that will surely be a topic of discussion not just for those who cover the sport like yours truly, but also Boxing fans. Both fighters are capable of getting an opponent out of there should the opportunity arise and that alone should make this an interesting fight to watch. While what the two fighters have left to offer at this stage in their respective careers is also a topic to be discussed, each has the type of name recognition value that the winner will likely be in line for another marquee fight down the line in the crowded and talent deep Welterweight division. When a “Crossroads Fight” such as this takes place the question of what the fighters have left in them is logical to ask. At this stage in each fighter’s career, as tempting as it might be to analyze what each brings into the ring for what could be seen as a prediction of what may or may not happen come fight time, it may come down to another cliché of simply who wants it more. We’ll find out when Rios and Soto square off Saturday night. Rios vs. Soto takes place on Saturday, February 23rd at the Municipal Auditorium in Tijuana, MX. The card can be seen in the United States on digital sports streaming network DAZN beginning at 7PM ET/4PM PT. To subscribe to DAZN, a list of connected streaming devices, availability internationally, schedules, and to start your free 30-day trial please visit: www.DAZN.com. In the United Kingdom and Ireland, the card can be seen on Sky Sports Main Event beginning at Midnight (Sunday, February 24th Local UK time.) For more information about Sky Sports, schedules and availability in your area please visit” www.skysports.com. 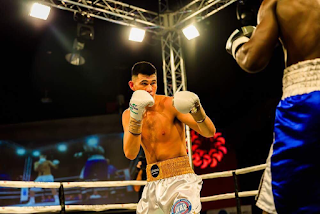 Press Release: February 20, 2019 By Dragon Fire Boxing – Brisbane Light Heavyweight Reagan Dessaix takes a jump up in class as he takes on former IBO World Light Heavyweight Champion Blake Caparello at The Melbourne Pavillion this coming Friday. 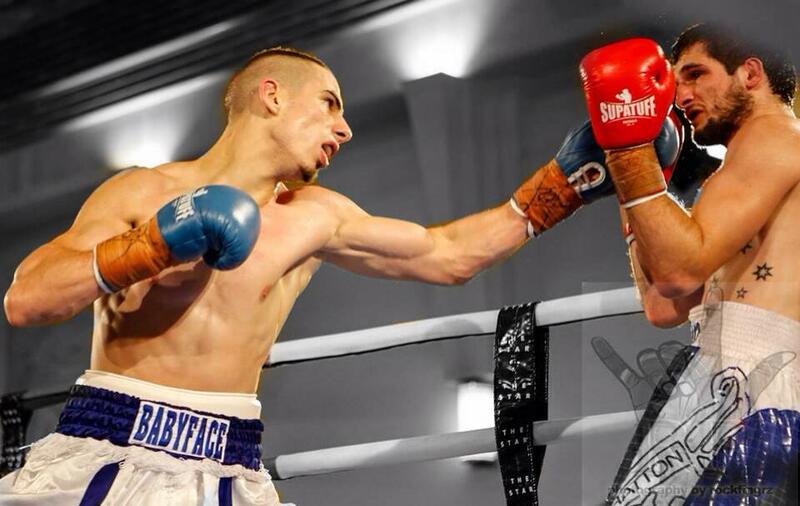 The pair will contest the WBA Oceania Light Heavyweight title, in what is a real crossroads fight for the Australian duo. Dessaix discussed his feelings on the former world champion Caparello as he winds down training ahead of the biggest fight of his career. “I believe I am a top-level fighter, and I’ve been the underdog many times before including my last fight. This is nothing new to me. It’s about me going in there and proving that I am a top-level Light Heavyweight which I believe I am. Dessaix is managed alongside the heralded Moloney brothers by Australian Boxing Supremo Tony Tolj. Dessaix discussed life alongside the Moloney’s and under the guidance of Tolj. Press Release: By DAZN/Matchroom Boxing USA - NEW YORK, Feb. 19, 2019 - Media gathered for the kick off press conference at Madison Square Garden in New York City on Tuesday February 19. DAZN and Matchroom USA formally announced the United States debut of Anthony Joshua to defend his WBA Super, IBF, WBO and IBO WorldHeavyweight titles against Brooklyn’s Jarrell ‘Big Baby’ Miller at Madison Square Garden on Saturday June 1, live on DAZN. “He punches like a fairy. Fury knocked him down seven times. He’s the softest puncher in the division. I am going to knock him the f*ck out. He is a drug abuser. He’s a kickboxer. I am going to knock him out. (Miller screams about Anthony’s mother.) Where’s your mother? I am paying her rent with this. She will come here and watch a real champion fight. “I’m home. I’m ready. You have no idea. I breathe, eat, sleep Anthony Joshua. I have a screen saver of Anthony Joshua. I wake up and think about Anthony Joshua. I see my mother go through some stuff that none of you would survive. I grew up in a third world country. I see my family starving with no shoes on their feet. This is bigger than a fight with Anthony Joshua. It is bigger than me. It is bigger than money. “There were many years that I didn’t know what I was doing with my life. I’ve always had this anger and drive in my stomach though that would keep me going. I knew that I must be fighting for something. Man, God has a plan for everybody, remember that. It’s bigger than me though, and AJ is just in my way. “Yeah, he won the Olympics. But that was in his city, they gave it to him. People call me the underdog but that’s alright. I want to be the underdog. I wasn’t born with a silver spoon. “I want to thank New York City. Thank my mother and my wife. My sister and my trainers. We are from the dirt. From the gutter. We are from under the dirt but I work hard for this. He didn’t want this fight first. He wanted to fight Whyte. That’s fact. “Watching Anthony Joshua fight in the U.K. is one of the most spectacular experiences that I’ve encountered in boxing. The crowds, the fireworks and the noise are quite remarkable. But like DAZN, AJ has ambitions to be a global superstar and achieving that means taking your show on the road, across the Pond. "For the first time in his career, Anthony Joshua will be fighting live and in primetime in the United States. 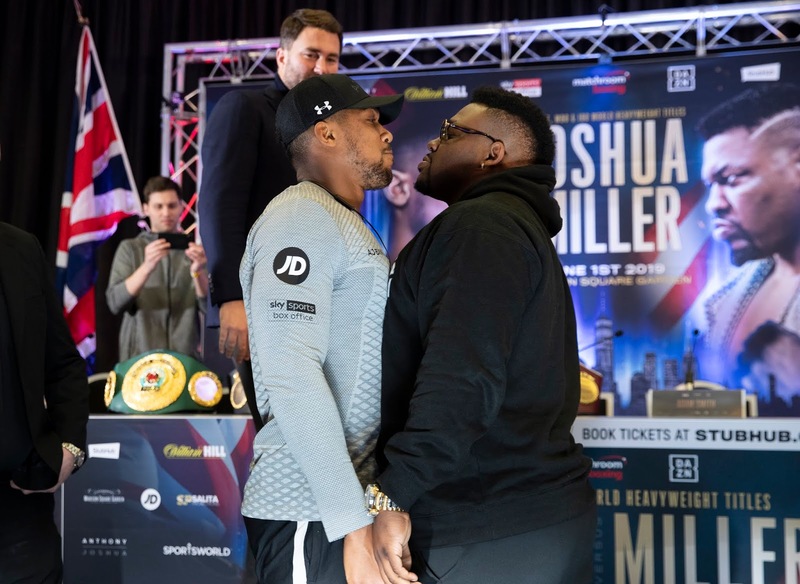 And he’s not just fighting in America; he is going right to the hometown of a dangerous Top 10 heavyweight in Jarrell “Big Baby” Miller – a man with as much to say as almost anyone else in the boxing game. and many others have invited AJ and Jarrell to their offices this week to discuss the bout. It’s a compelling matchup that is already generating genuine buzz in the US. "Moreover, it demonstrates DAZN’s continued commitment to our mission goal of delivering amazing value to fight fans. By the time of AJ-Miller, U.S. boxing fans will have already slogged through several expensive pay-per-views in 2019. More than $200 for three fight nights. For that type of money, you could have DAZN for two years and get every boxing and MMA fight on our platform. "You can see the momentum we’re building in the names we are signing and the types of fights we are making: AJ’s debut in the U.S., Canelo Alvarez vs. Daniel Jacobs for Cinco de Mayo. And there is more to be announced very soon. 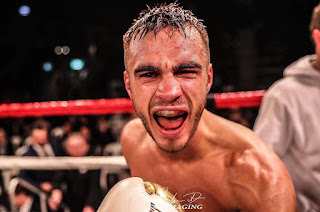 Material Courtesy of DAZN/Matchroom Boxing/ Photo Courtesy of Ed Mulholland/ Matchroom Boxing USA Used with permission. To subscribe to DAZN, a list of connected streaming devices, schedules, and to start your free 30-day trial please visit: www.DAZN.com.